solar photovoltaic energy in brazil Archives - Sopelia is the solar platform in Latin America. Photovoltaic solar energy in Brazil has taken important steps in self-sufficiency and net balance. Distributed generation is entering the country more easily than large-scale facilities. It is betting on a model of small and medium power generation plants for households and businesses consumption. In 2012 standards were approved to reduce barriers for distributed generation and small power facilities for micro (up to 100 kW) and minigeneración (100 kW to 1 MW). Since its publication in 2012 until March 2015, 534 systems (500 photovoltaic, 19 wind, 10 solar / wind hybrid, 4 biogas and 1 hydraulic) were installed. In late 2015 the government launched the ProGD program that includes tax exemptions and special credit lines. It expects to reach 23.5 GW of installations, most photovoltaic, in 2030. To achieve this goal, barriers to grid connection should be reduced, standards system power compensation should be harmonize with the terms of the offer, target audience should be increase and improvements in the application of the standard should be achieve. The government has announced a ICMS (Imposto on Circulação of Mercadorias) reduction, levied 18% on imports and is one of the world highest. In 2016 it also announced the exemption from Industrial Products Tax (IPI) for photovoltaic components that are not produced locally. These taxes and fees added to the Inmetro (National Institute of Metrology, Standardization and Industrial Quality) Certification and Supplemental ISS rate, which municipalities retain on services not taxed by the ICMS (2% to 5%) represent a significant barrier to the development of photovoltaic in Brazil. Industry sources indicate that import components to produce solar energy in Brazil now, means supporting a tax charge between 60% and 405%. The opportunity for large scale photovoltaic solar energy has come up with the first time participation in the A-5 energy auction in December 2013 and the Pernambuco state auction same year. Fontes I and II solar plants with 11 MW in Tacaratu, Pernambuco, and to Fontes dos Ventos wind farm of 80 MW, form a hybrid solar-wind complex of 91 MW; the first of its kind in the country. Both projects have a 20 years solar power purchase agreement (PPA) and are the largest photovoltaic plant in operation in the country. In the course of the 1st Reserve Energy Leilão 2015, promoted by the Brazilian Federal Government, 30 photovoltaic projects have been awarded 1,043 GWp. that will mobilize more than U$D 1,187 million investment. The average final price of U$D 83,3271/MWh hired implies a discount of 13.5% over the initial price and a great success, reaching one of the lowest prices in the world. The awarded projects are located in the states of Bahia, Piauí, Paraíba, Minas Gerais and Tocantins. Are 20 years contracts of energy sale, valid from 1 August 2017. The last photovoltaic government plan sets a target for 2024 of 7 GW in large scale installations and 1.32 GW in distributed generation, doubling their previous plans for 2023. 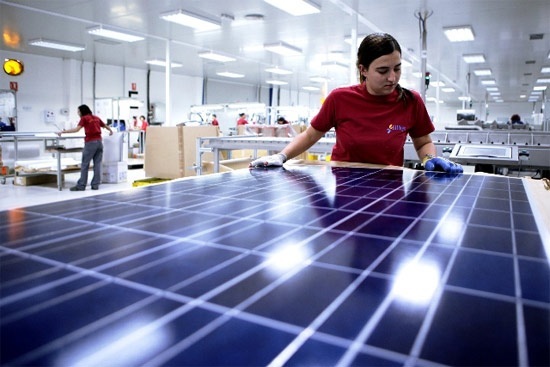 The first solar modules factory in Brazil began operating in Valinhos in 2015 with an annual production capacity of 580,000 modules. It aims to implement a new production line in 2016 to manufacture up to 1 million modules per year.